We have the Good in colors (the blue, red and yellow) . Now let’s go with something less color significance and more of the bad. Let’s us welcome the Star who screams – Mr. 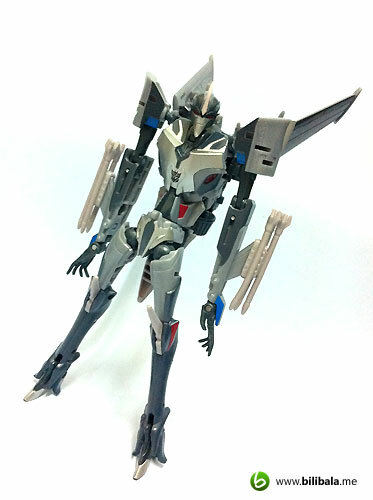 Skinny Starscream! Well, this new reincarnation of him does really put on much weight and not to mention he has gained some height as well. 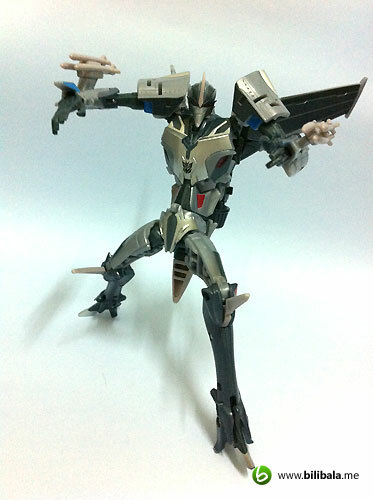 So far, he is the tallest among the Prime Deluxes and definitely you will like him being the MOST evil grinned villain in the galaxy! Read on! (A) What’s in the Package? 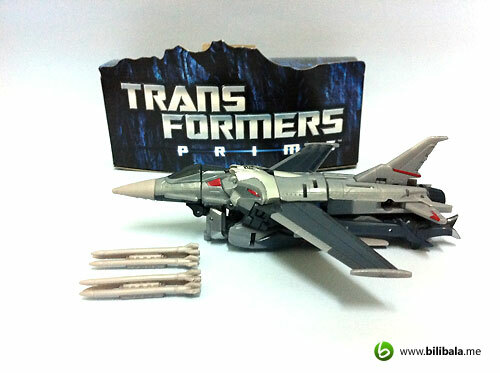 What comes with this Starscream is a pair of missiles which you can attach them to both the fighter plane or the robot mode. 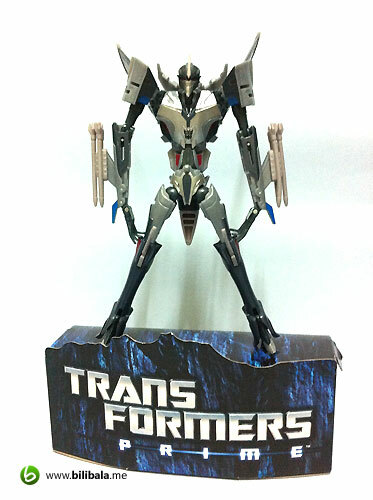 And of course, here’s your paper stand again which you will get plenty of these if you start collecting Transformer Prime toys. Again, the paper stand is generic type without unique identification to which character is it attached to. 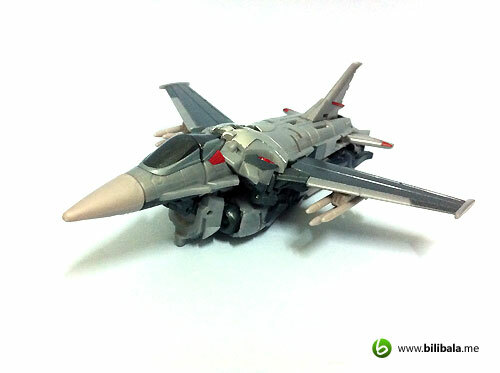 As similarity in most of the Transformer movie/cartoon series, Starscream makes a come back, and yes, not to fan’s disappointment and surprise, he is a fighter plane again. 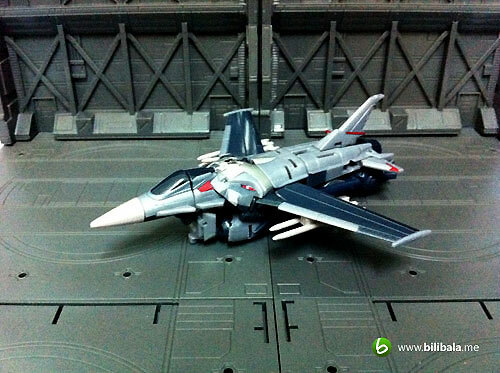 This really gives me the impression of relatedness between a fighter plane and Starscream. 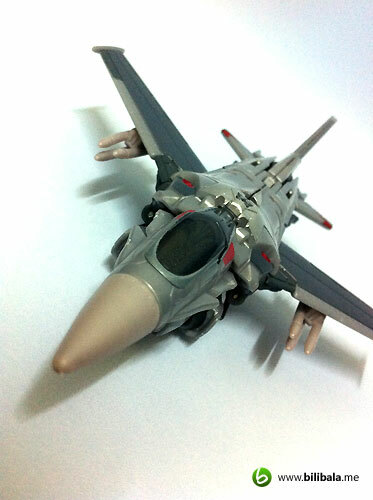 Everytime when Starscream is being mentioned, the word “Fighter Plane” floats into the mind automatically. Anyhow, 1st impression on the quality of him, quite solid built, surprisingly lighter despite the “looks” of it being heavy. The overall colors of him is a mixture of various shades of grey and darker navy blue. Much details can be seen as painted in red as well. 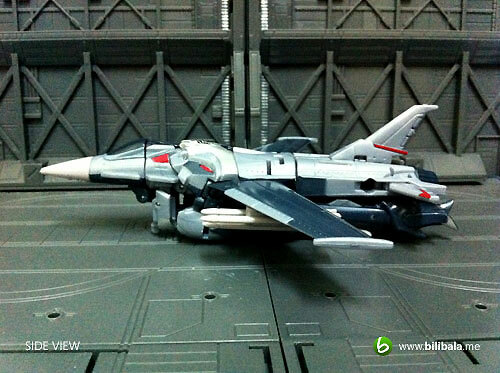 The only metallic silver painting can be observed is the part near the cockpit (where the Decepticon insignia is). The overall color composition is great imho. 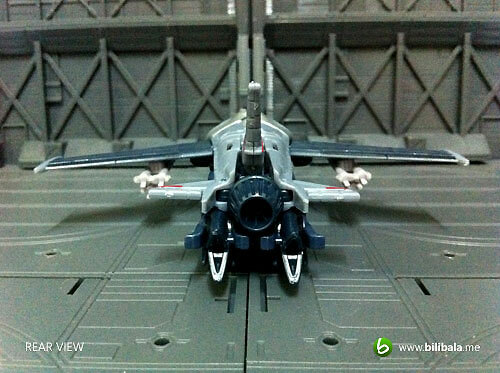 Some of the “pointy” parts of him are made of soft rubber (which includes the bow of the plane and the 2 missiles). Kinda like adhere to the child-safe policy. 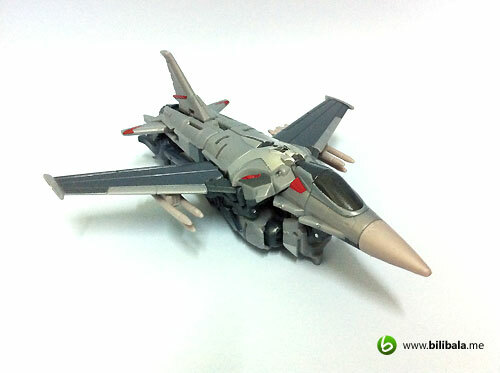 The cockpit window is actually just a slap-on glossy paint and not those transparent plastic as it meant to be. 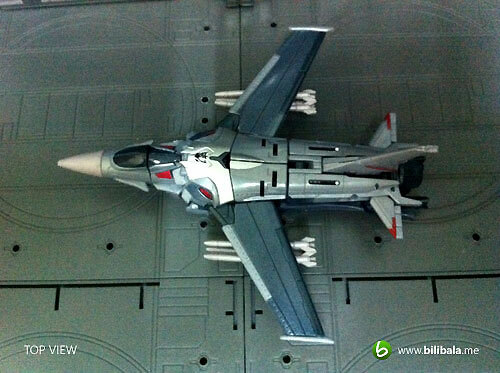 Anyhow, pretty nice and great profiling of the plane with different color treatment done to him. See the various parts being painted in red. It somehow breaths the details into the overall dull color of grey. 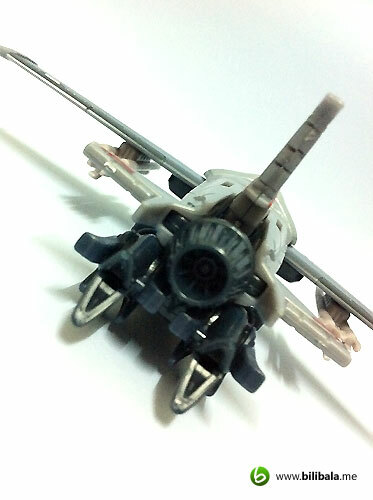 In addition, the plane does not come with retractable landing gears. But this does not compromise the effort of placing it on a flat surface. 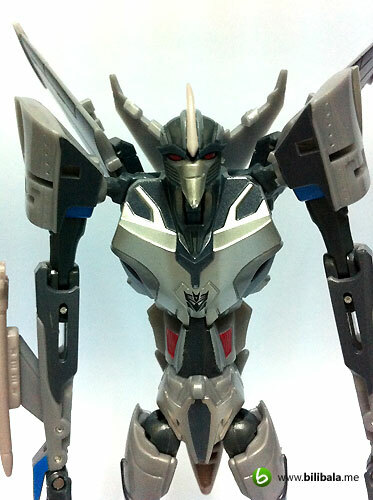 From top part, you will notice clearly the silver metallic painting with the Decepticon insignia. 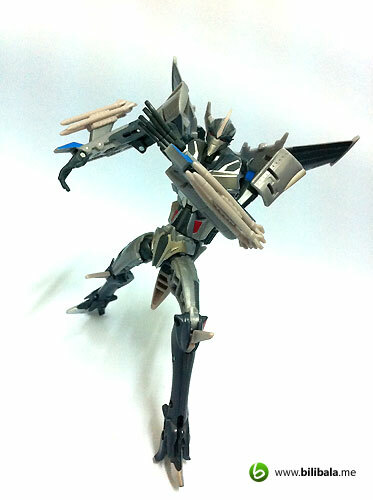 Let’s move on to the robot mode. 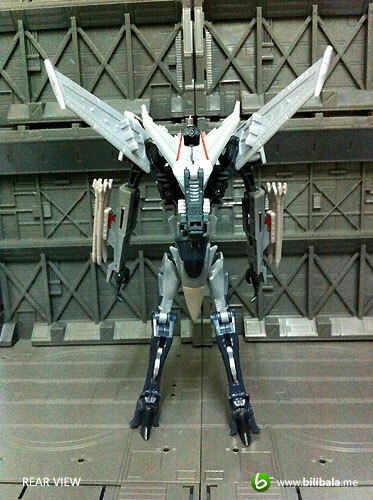 It’s quite amazing that from a small and chubby fighter plane will turn into a tall and skinny Starscream. 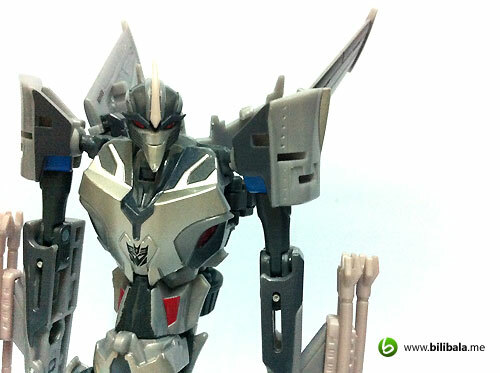 1st impression on him, he really put on much weight and you wont see him as muscular as Mr. Bumblebee. 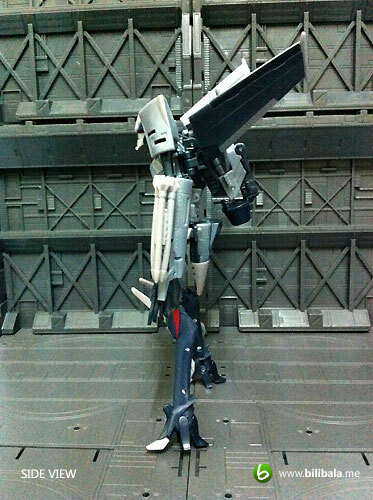 Design is on par with movie accuracy and definitely you will see the thin and skinny limbs in him. 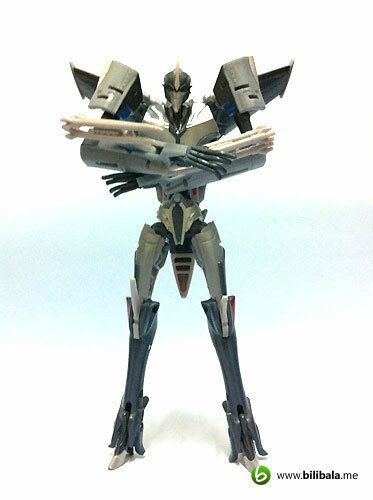 Articulation on him is quite standard with extra ball joints on the neck and waist joints. 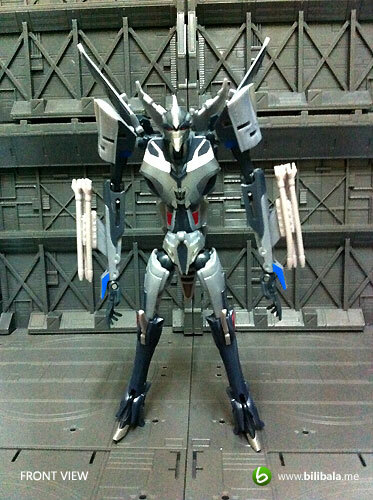 Overall color scheme is further enhanced with a touch of blue on the upper and lower arm . That constitutes the 6th color elements in this multi-color composition of him which really brings out details. 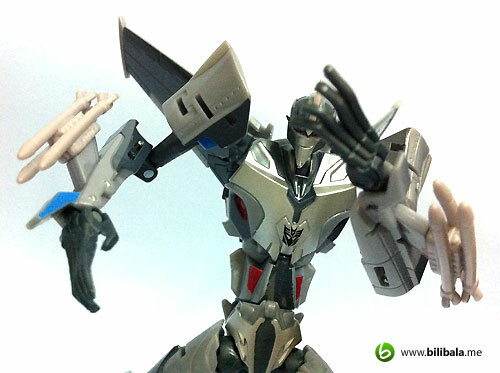 Definitely i found he has the most color compared to the previous Primes toys i have reviewed. Kudos to Hasbro in bringing out these minor details in coloring! 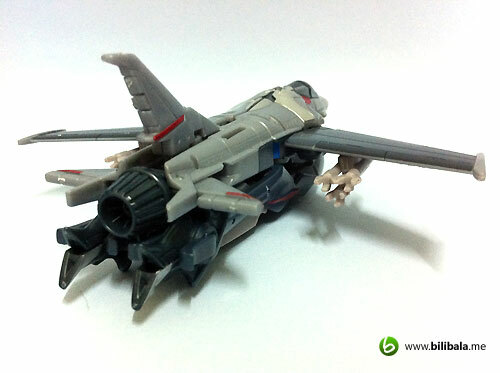 Starscream has the “backpack” design which is quite logical and reasonable as that will become the flying mechanism for him in robot mode. And instead, the backpack is nicely designed as that is the same trust engine from the alt mode and being carried forward to the robot mode. Pretty much like he is like a Rocketeer or some sort. 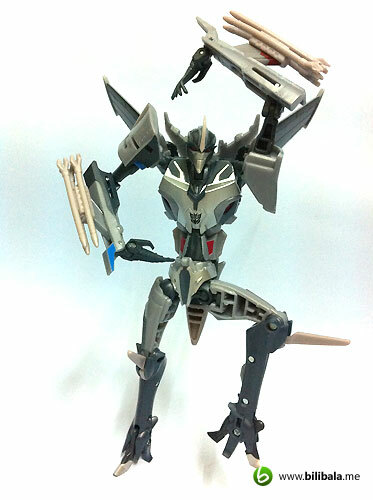 However, i found this make him a slight hunchback which somehow fits into the description of him being the evil assistant Igor for the lord Megatron. 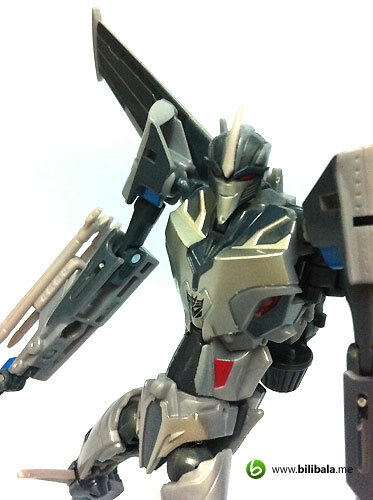 Anyhow, despite the heavy looking jet pack design, the body to weight distribution is still nicely done where it wont pull the whole figure backwards. Moving on, i don’t really much fancy about this “chicken-feet” like design for him (as you can notice above). Is like a guy wearing high heel and definitely i found posing with him is quite difficult. 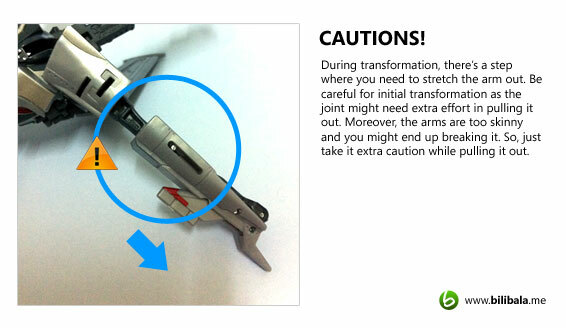 There are no additional ball joints at the ankle further hinder the posability. 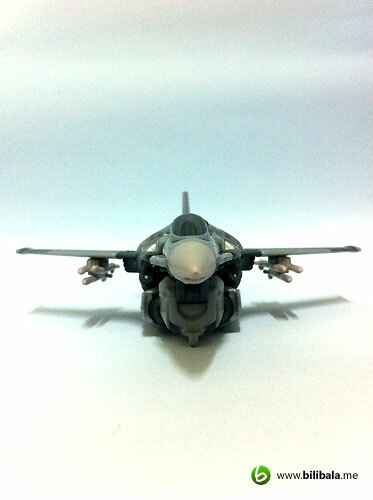 In addition, you can actually freely adjust the wings on the jetpack which is quite a great design as you can spread it wide open as if he is flying or even flip the wings to remain in their storage position. 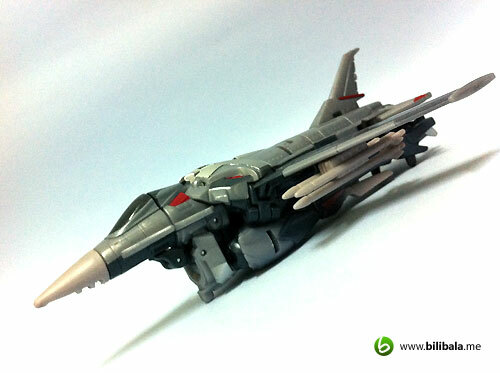 Another plus point for having such a great mold design. Let’s move on the emotional part of him: his robotic facial. 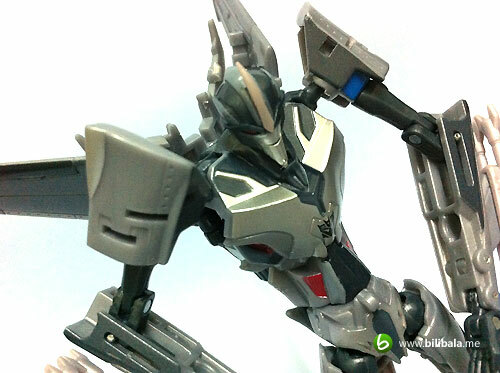 You definitely see movie accurate facial for the robotic head. 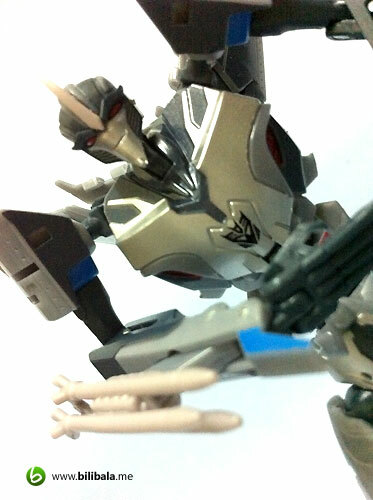 With the evil grin and cunning face, this is definitely the Starscream you wanted to see. 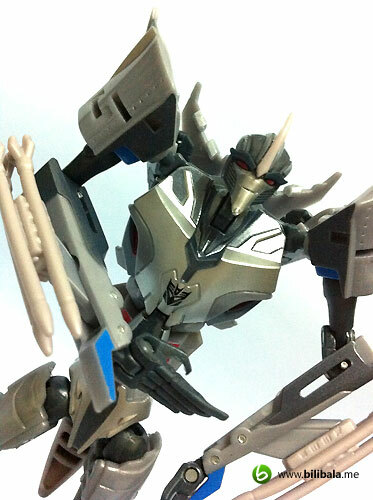 And you definitely see the same protruded single horn (which is in soft rubber as well) design on his forearm. The chest part is in metallic silver painting and with 2 fiery red color on both sides of the chest which looks like a 2nd pair of eyes. 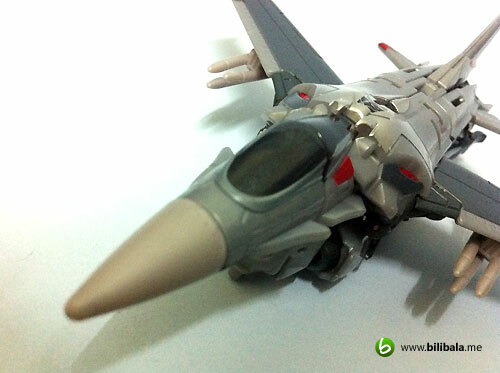 In addition, Starscream has no light piping to light up the eye. 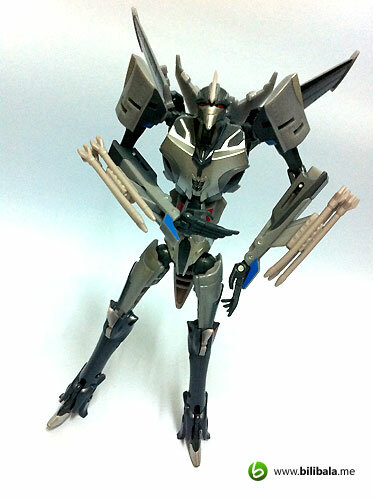 Color of the eyes are purely painted. 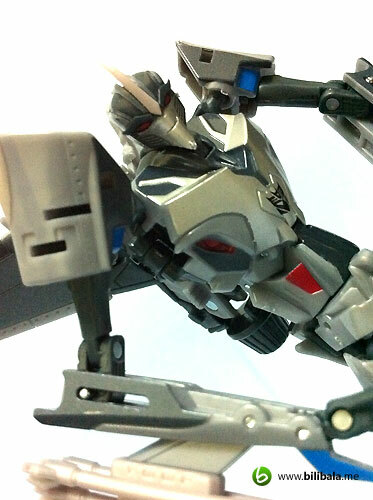 Transformation is quite fun with Starscream and very involving. There’s a lot of smaller parts to be flipped, twisted and snapped in. 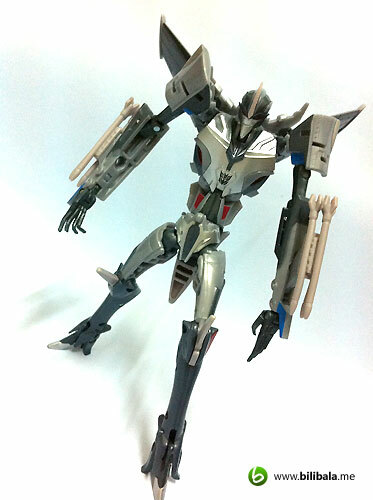 It might be a challenge for 1st time transforming him, but after a few attempts, you will be enjoying the whole process. 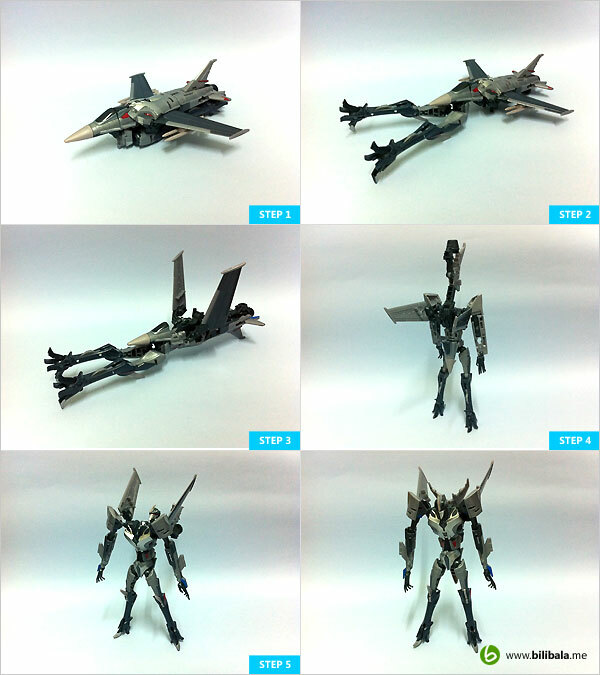 Here you go with tons of random shots on the alt mode and robot mode of Starscream. 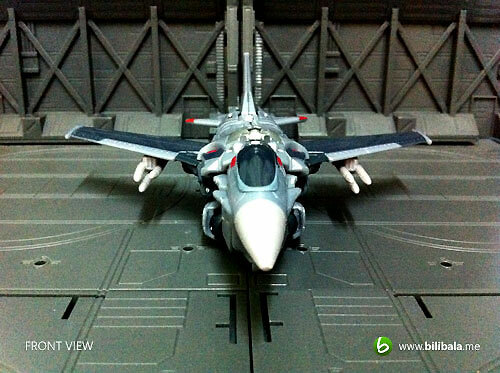 My favorite shot of the alt mode. This baby can fly! Close up on the thruster. Beware of fire coming out! 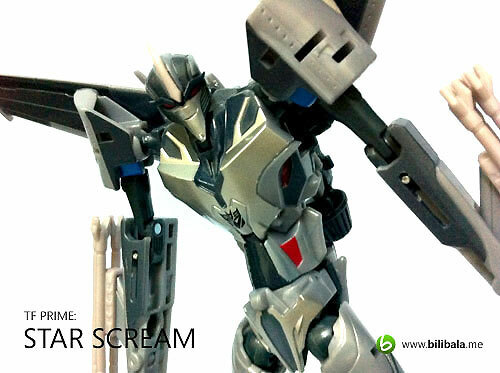 Closed up shot on the evil grinned Starscream. 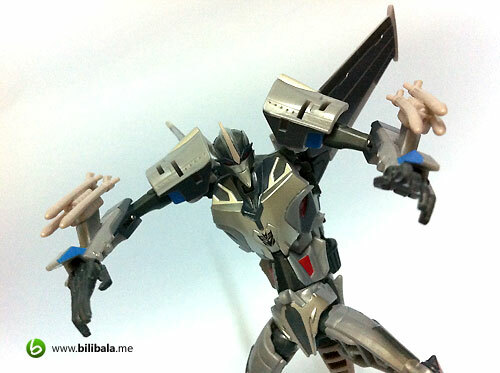 My favorite shot of him in robot mode. 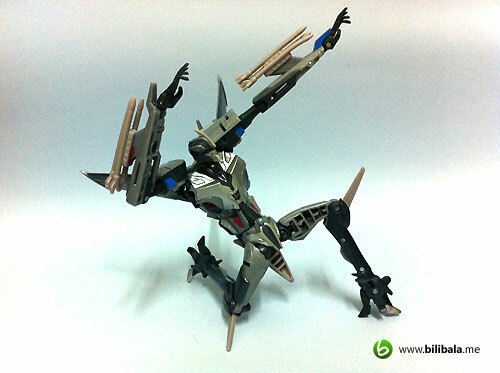 I don’t know about you, but of all the Transformers Prime toys, Starscream is the only one which make me wanna make funny pose of him. Maybe due to the skinny and sulky character of him. Here’s 2 funny shot to wrap up the section! 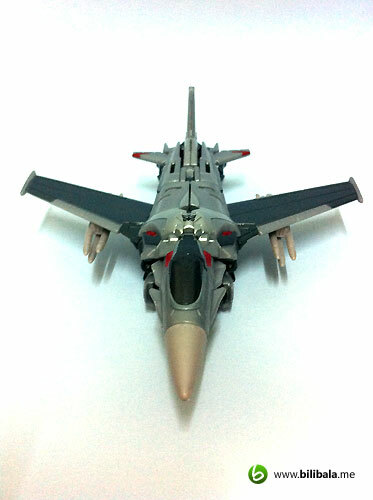 What I like – Multicolor composition which gives much details in both alt and robot mode; great evil grin menace facial expression for the headpiece; great design in the jet pack; very involving transformation sequence. 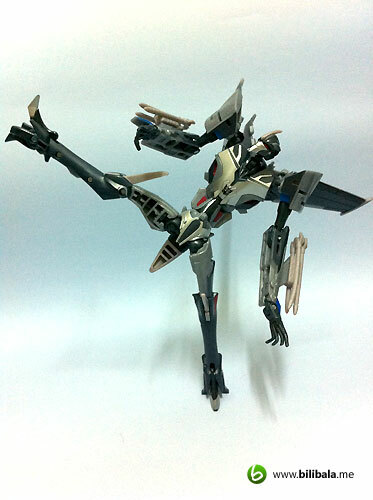 What I dislike – Chicken leg design without additional ankle joints make it difficult to pose; certain part of transformation need extra care (i.e. the stretching out of arms).